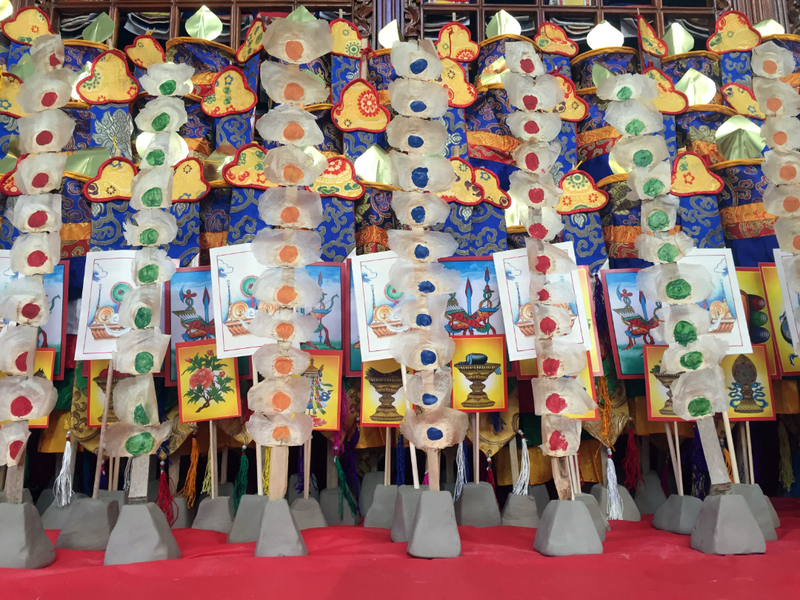 ← May the Wheel of the Yungdrung Bön Turn Forever! 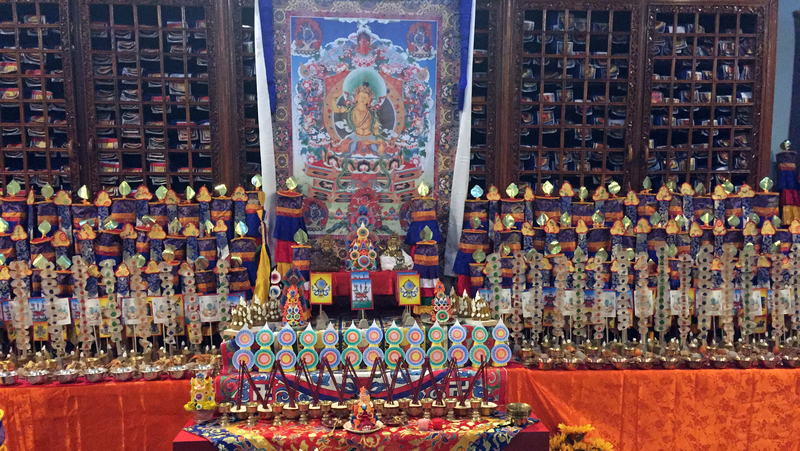 In celebration of nearing the completion of their new building as well as 25 years of operation, Ligmincha International is sponsoring The Thousand Offerings to Nampar Gyalwa and the Nampar Gyalwa Fire Ritual. 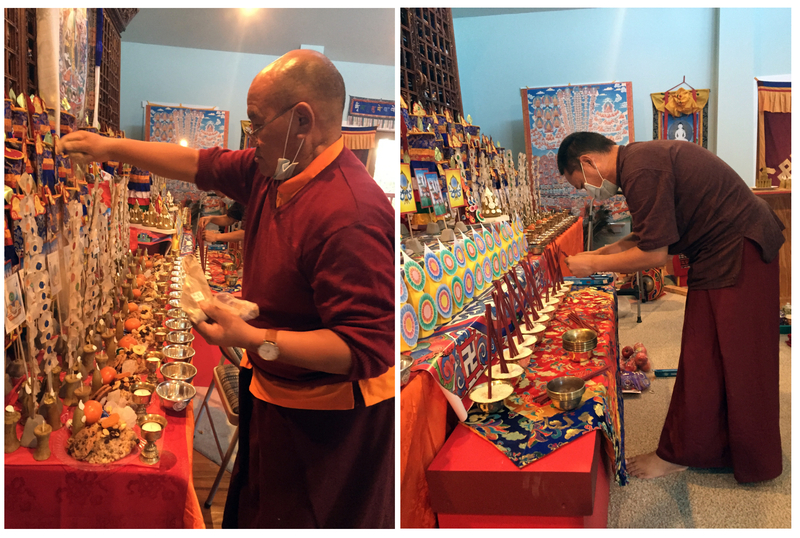 The ritual is being led by the master ritualist and Yungdrung Bön lama Geshe Nyima Künchap Rinpoche and assisted by a number of monks and geshes. Therefore, although there are many fire rituals within the Yungdrung Bön tradition, the fire ritual of Nampar Gyalwa is especially powerful for the consecration of new buildings and increasing prosperity. During any fire ritual, all of the deities are invited to manifest through the wisdom fire. A great variety of offerings is then given to the fire such as the five grains, the three sweets things, the three white things, and representations of things such as music, coats of armor, and jewels etc. Some of the fire offerings. We imagine that through making these offerings to the wisdom fire of the deities, we generate great merit and all of our negativity such as the five poisons including ignorance and lack of awareness, karmic potentialities, contamination due to desecration of our vows, obstacles, dangers, illness, bad omens and dreams, bad astrological influences, and any other negativity is completed and utterly incinerated. In this way, we become completely victorious over obstacles and clear the way for blessings,prosperity, success and spiritual development to manifest. Posted on October 18, 2017, in Uncategorized. Bookmark the permalink. 3 Comments. In the last picture, is there a significance to the 11 dots or shapes on the vertical offering, which has a name I don’t know? No, there is no significance for the number. Some have more, some less. This is the flower offering using the paper thin and petal-like seed pods of the tsam pa ka tree. The color is like an ornament.